Learn how to crochet with our five-part beginner's guide to crochet. Read beginner crochet instructions and watch a beginner crochet video in each section to master the techniques used in all crochet projects. As a complete novice to the craft, knowing where to begin in crochet is difficult. First, you need a crochet hook and basic yarn. An “H” hook is often recommended for beginners with some inexpensive acrylic yarn. American sizes range from B (smallest) to S (biggest), so you can get an idea of where this size sits. 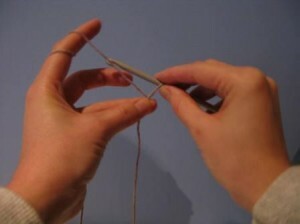 Use the image above as a guide to how to hold the hook and yarn. For background information on crochet, abbreviations and free crochet patterns for beginners, see this article. Yarn Over (abbreviation yo)- Don’t laugh crafters! I’ve seen this several places now and basically it means bring the yarn over the hook so that the hook can catch the yarn and draw it through the loop. Literally, the yarn comes over the hook ... hence the name. That’s the beginning. Read on for the first stitches! Don't forget about the 16 Free Crochet Shawl Patterns eBook! Do you have beginner instructions for someone who is left handed? I'm a beginner on making granny afghans, the one that is continuous squares, do you have a tutorial on that? Thank you. I resently became disabled and need something to past the day. I have limited hand and finger mobility but wanted to try to crochet again. This article help me brush up on the different stitches. I am 3/4 the way done with a baby afghan and I am thrilled with the results so far. Thanks for helping remember how to crochet and giving me a challange. Wow this is amazing... how easy is this? Play by play showing you how to do it... Thanks so much for sharing. i didn't understand what the numbers meant could you please explain them more to me? I am just beginning to crochet. I have made several samples of many different stitches. I was starting to make a of slippers with some yarn that someone bought for me, I did the first row and i am stuck. the instructions say " row 1: Ch 23 (25, 27) dc in 4th ch from hook and in each ch across, turn-21 (23, 25) sts." I am stuck on that last part. I understand how to turn, but I don't know what the numbers mean. The instructions say this after each row. Can anyone help please? Thank you for your time. looking for a crochet pattern for adult sized tube socks and leg warmers. Readerwoman: I found a left-handed crochet tutorial at http://lefty-crochet-mania.blogspot.com. If you want something to have at home you can purchase a kit by Boye or an American School of Needlework book, both of which have left-handed instruction. Once you are comfortable with your crochet skills, you will be able to make any pattern. could you please explain how to make a magic circle. Responding to Crocheted Heart Shaped Pattern sugarncream.com. You must register to view or download patterns. The pattern you may be seeking is titled Love Bugs. When you type that into the Search window, it will appear. I hope this has been helpful.